Danish Design Universal Waterproof Car Seat Cover is a perfect way to ensure that your car seat is protected from the mess that your dog leaves in your car. This great universal car seat protector is made from a hardwearing and waterproof heavy duty material to ensure maximum protection. Easy to clean with just a wipe of a damp cloth, this car seat cover also has adjustable headrest ties and access points for seat belt anchors. 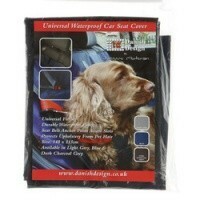 No longer is taking your pet out for long muddy walks a hassle with this fantastic car seat cover! This seat cover measures 140 x 115cm in size.